C. chinensis is one of the largest species of the Viviparidae family, growing up to 3″. There are many discrepancies among people about how big these snails actually get, but the maximum size seems to be determined by the environment. 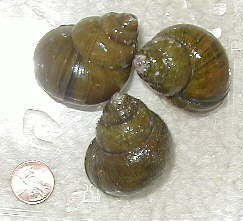 Some snails do not reach over 1.5-2″ in size, while others dwarf the smaller species of apple snails. Cipangopaldina chinensis can handle a wider range of temperatures than C. japnoica, but it should not be kept in water over 80 degrees Fahrenheit (in fact, they seem to prefer water in the same range as C. japonica, not exceeding 75F, but tolerate higher temperatures better). This species is currently invasive in several places in the United States, such as Texas. After arriving in Connecticut to begin my studies at Yale, I found that this species was actually the dominant snail species in the shallows of some of the lakes. Cipangopaludina chinensis seems to thrive in New England, although it may retreat to deeper waters in the lakes during some of the hottest weeks of the summer and also during the late fall through early spring.